LEGO Master Builder Moko has been painstakingly working on a near 4ft tall LEGO replica of Evangelion’s Eva Unit-1 for the last 3 years. The artist finally unveiled the creation this week and the results are simply stunning. Fully articulated and containing no painted or modified bricks, the model weighs in at over 20lbs and perfectly captures the look of the Evas. Moko’s Flickr stream is full of awesome behind-the-scenes construction photos that detail just how much work actually went into this incredible creation. 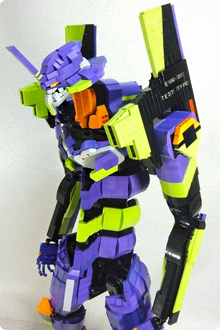 The scale shot of the artist standing next to Unit-01 is amazing. Check them out.